Everyone is welcome. All that counts is that you want to connect with like-minded international people! Please join us for drinks, dinner and casual networking. No cover. Pay for what you consume. With extended hours, an exuberant atmosphere, and a variety of local and international dishes, Protected content provides the perfect place to enjoy a meal at any time. 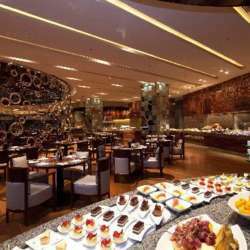 Guests can dine from the buffet or à la carte, choosing from the finest dishes and desserts from Mediterranean, Chinese, Filipino, Japanese, Indian and other Asian cuisines. Each dish is freshly prepared by our award-winning team of chefs from around the globe. They’ll be happy to meet you in the dining room with suggestions on what you might enjoy. The dining room of this stylish venue seats 240, and its two private rooms seat 12 to 18 guests.